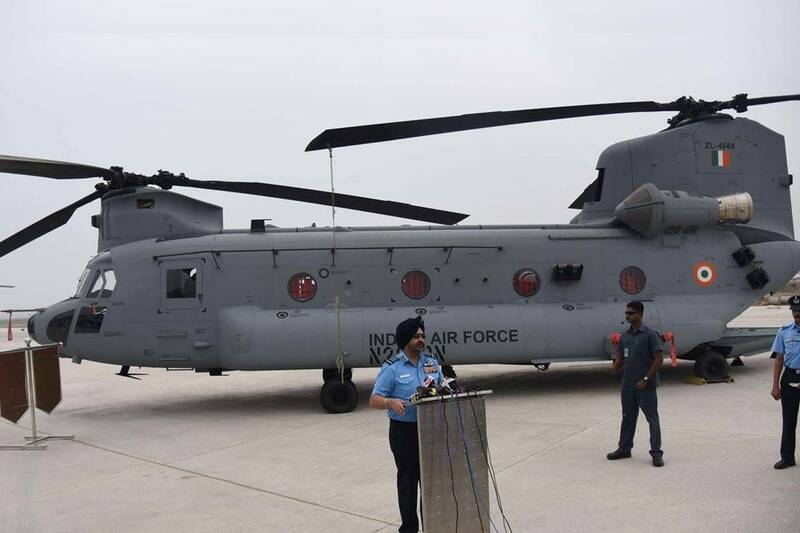 The first four of the 15 CH-47F (I) Chinook helicopters, which were ordered from US-based aviation giant Boeing in September 2015, were inducted into the IAF’s 126 Helicopter Unit (HU) at a ceremony in Chandigarh on Monday. The first batch of four helicopters has been delivered on schedule and the last batch is to be delivered by March next year. These IAF Chinook helicopters will be deployed in the Northern and Eastern regions of India. Air Chief Marshal BS Dhanoa, Chief of the Air Staff, was the chief guest and the event was attended by various other dignitaries. After inducting the choppers, whilst sharing his thoughts, Chief of the Air Staff B S Dhanoa said, “Induction of Chinook will be a game changer the way the Rafale is going to be in the fighter fleet”. Senior IAF officers present at the event said the combination of Mi-26 chopper and Chinooks in a single unit would give the 126 HU an unmatched air mobility capability never replicated anywhere in the world, directly contributing to the operational preparedness and potential of the Indian armed forces. The Chinook, twin-engine, tandem rotor, is a multi-role, vertical-lift platform, which is used for transporting troops, artillery, equipment and fuel. The all-weather choppers can also be used for humanitarian and disaster relief operations and in missions such as transportation of relief supplies and mass evacuation of refugees. The choppers are capable of airlifting diverse military and non military loads to remote locations. The helicopter can carry out military operations not only during the day but at night too. “Primary use for which we have got training is cargo and load transport. In cargo, the chopper can carry load up to 11 tonne in forward areas, artillery guns, bulldozers, road building equipment, all these things it can carry under slung (suspended from the underside of the chopper),” Yadav added. The addition of heavy-lift CH 47 F (I) helicopter is being seen as a significant step towards modernisation of the Indian Air Force’s helicopter fleet. The helicopter has been customised to suit IAF’s future requirements and capability roadmap. It has a fully integrated digital cockpit management system, advanced cargo handling capabilities and electronic warfare suite that complement the aircraft’s overall performance.